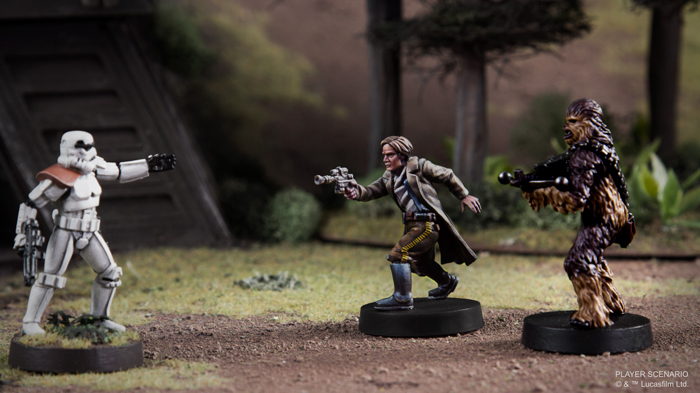 Releasing alongside the Wookiee Warriors Unit Expansion, you’ll be able to bring your own detachment of mighty Wookiees to the battlefields of the Galactic Civil War late in the fourth quarter of 2018. 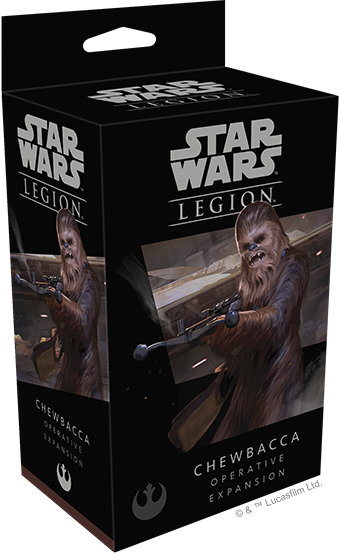 With the Chewbacca Operative Expansion, Rebel generals have new options for building their armies. In Star Wars: Legion, every army can pair up to two operatives with the one or two commanders that they’ve chosen to lead their foot soldiers and vehicles into combat, and Chewbacca makes a welcome addition to any army. Towering over most of his foes, Chewbacca can easily overpower any enemy units that stand in his way, making him one of the most powerful melee characters in the game. When it comes time to fight, though, Chewie would just as soon use his bowcaster. This powerful weapon packs quite a punch, both cutting through enemy blocks and blasting through their armor. Despite the raw power that he brings to every battle, Chewbacca’s greatest strength might be the relationships he has built with the commanders he’ll join on the battlefield. He was flying with Han Solo long before they joined the Rebellion, so it’s only natural that the pair should be fighting in sync in the heat of battle. Both heroes are formidable combatants on their own, and Chewie’s Teamwork ability further encourages him to work side-by-side with Han. This ability simply allows Chewbacca and Han Solo to gain an aim or dodge token whenever the other unit gains a token of the same type! Chewbacca gains an aim token whenever Han Solo gains an aim token and is in range! These strong relationships are even more evident in Chewbacca’s signature command cards. 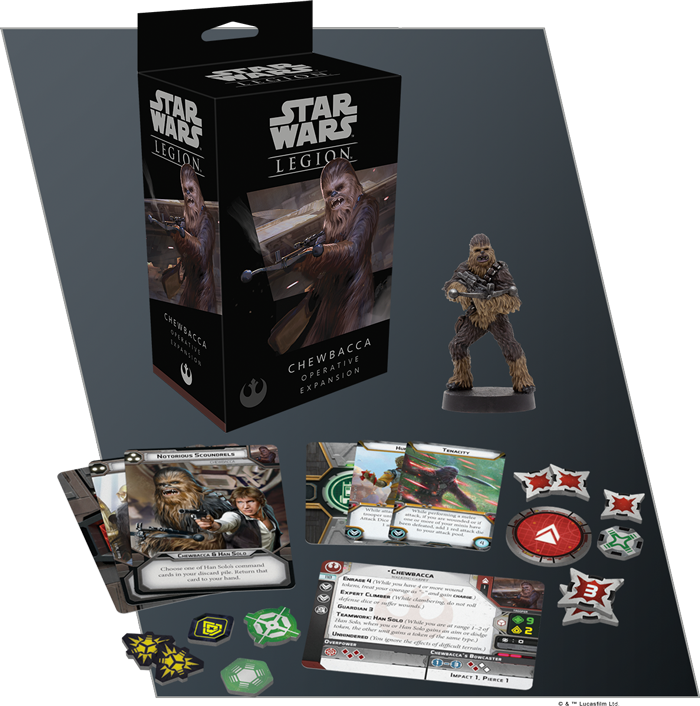 In addition to Han Solo, Chewbacca also formed a strong connection with both Luke Skywalker and Leia Organa during the Galactic Civil War and each of his command cards gives you the power to use Chewie in tandem with one of these iconic heroes. 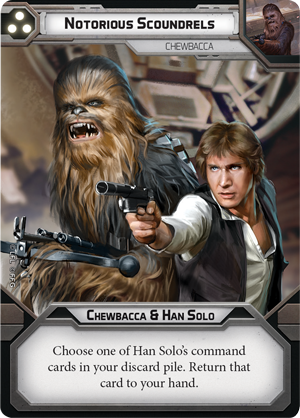 For example, the strong affinity he shares with Han Solo allows you to ignore the normal rules concerning command cards. 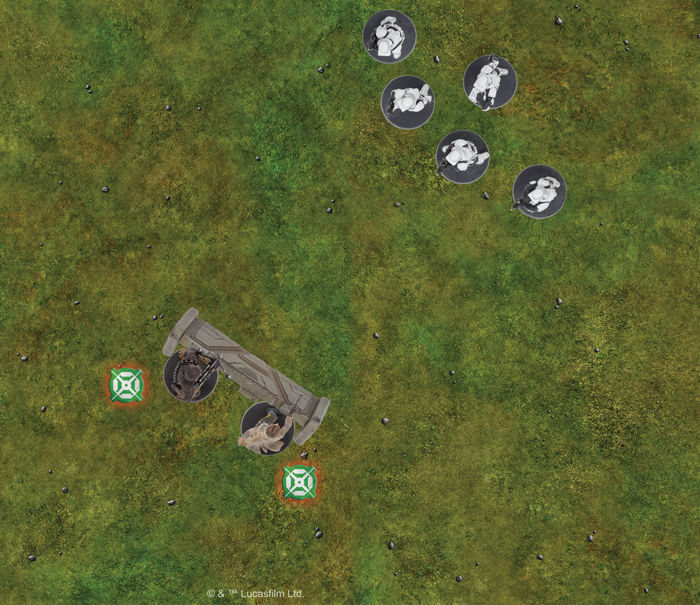 Normally, a command card is discarded at the end of the round it is revealed. But Chewbacca and Han Solo have a reputation as Notorious Scoundrels, allowing you to bring one of Han’s discarded command cards back to your hand for another use. We’ll take a closer look at Chewbacca and all of the cards included in this expansion in a future preview! 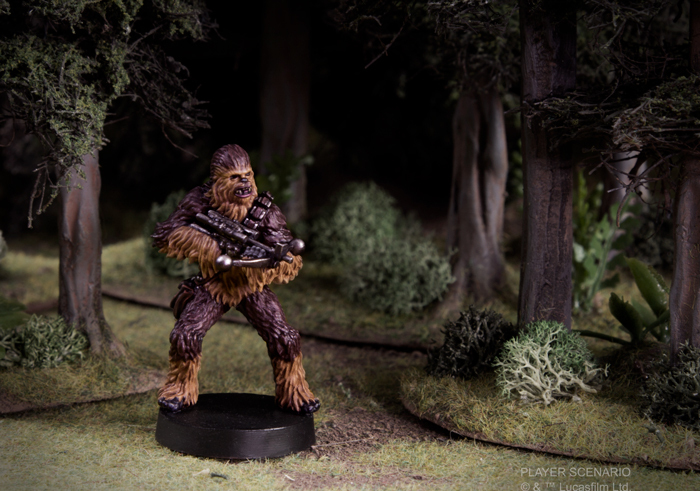 Chewbacca brings a new level of ferocity to the battles of the Galactic Civil War, and he doesn’t like to lose. Soon, you’ll be able to tap into this untamed power during your games of Star Wars: Legion.